Preheat oven to 325°F. Spray three 6-inch round cake pans with cooking spray. In small bowl, sift together flour, baking powder and salt. In bowl of stand mixer fitted with paddle attachment, beat sugar and butter until light and fluffy. Add lemon zest and extract; mix until just combined. In alternating additions, add milk and flour mixture; beat until just combined. Divide batter between prepared pans (if scaling, each pan will take approximately 6.9 ounces of batter). Transfer pans to oven and bake 17 to 20 minutes or until toothpick inserted in center of cake comes out clean, rotating pans halfway through. Transfer pans to cooling rack; let cool 5 minutes before turning cakes out of pans onto rack. Let cakes cool completely before assembling cake. In heatproof bowl of standing mixer set over pan of simmering water, combine egg whites, sugar and salt. Whisk constantly by hand until mixture is warm and sugar has dissolved (when you rub the mixture between your fingertips, it should be completely smooth with no sugar granules still noticeable). Attach bowl to stand mixer fitted with whisk attachment. Starting on low and gradually increasing speed to medium-high, whisk 8 to 10 minutes or until stiff peaks form, and mixture is completely cool. With mixer on medium-low speed, add butter 2 tablespoons at a time, mixing well after each addition. Add extract, beat until just combined. Switch to paddle attachment; continue beating on low speed 3 to 4 minutes or until frosting is completely smooth, scraping down sides of bowl occasionally. 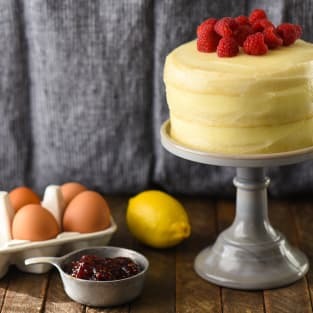 Place one cake layer on turntable or cake stand. Using piping bag, pipe a ring of frosting around outer edge of cake (this frosting ring will hold the preserves inside the cake). Spoon 1/3 cup preserves into center of ring; gently spread until you have an even layer. Repeat process with second cake layer. Place third cake layer on top. Use remaining frosting to thinly frost outside and top of cake. Garnish top of cake with raspberries. Cake batter recipe adapted from Wilton. Frosting recipe adapted from Martha Stewart.